As connected as it seems our North American bird blogging network is, it sometimes feel very removed from the greater international birding culture. 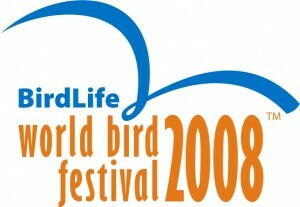 For example, did you know that this month, people all around the world are participating in the 2008 World Bird Festival? The 2008 World Bird Festival is a month-long celebration of the cultural importance of birds, with a special focus on migratory birds and their flyways. By the end of October, hundreds of thousands of people will have taken part in events which will have introduced them –perhaps for the first time –to the pleasure and fulfilment which comes from watching birds and helping to conserve them. They will also have a clearer understanding of the international scale of the threats to the birds which brighten their seasons, and the need for globally coordinated action. So a slew of nature walks, bird races, lectures, films, performances, art workshops and exhibitions, including events for children, will be staged by hundreds of organizations from Birdlife Partners to local natural history societies, yet I’m just hearing about this now? WORLD BIRDWATCH was established in 1993 to promote the appreciation of nature through birding. The idea was to get as many people to go birdwatching over one weekend, and to record as many of the world’s 10,000 species of birds as possible. Since the first WORLD BIRDWATCH in 1993, more than 750,000 people have participated from all over the world. A total number of 184,376 people from 88 countries participated in the WORLD BIRDWATCH and World Bird Count held in 1997, and the number of species reported reached 5,935. The Guinness Book of World Records certified this as the largest birding event in the world. In Europe, the WORLD BIRDWATCH is called EuroBirdwatch. This event, celebrated annually during the first weekend of October, comprises hundreds of activities in 24 European countries exploring the magic and beauty of birds in the wild. Again, this is the first I’m hearing of this event, which I should stress is touted as the largest birdwatching event in the world. The National Audubon Society is the BirdLife Partner for the United States, yet there is nothing about this on the Audubon site. Is it possible that we have so many separate birding events in the U.S. managed by Audubon in October that this modest month-long, global celebration of migratory birds couldn’t possibly fit on the social calendar? Check the Audubon website and see for yourself. Is it just that I’m out of the loop? Are you participating in WORLD BIRDWATCH this weekend? If so, where do you live and how did you hear about it? never heard of it I’m sad to say. I’d never heard of such a thing. Perhaps I just missed it in the BirdLife emails. Where Are You Birding This First Weekend of October 2008?